Summary: When your couch becomes saggy and old, it’s best to replace it right away. You’re sitting on your couch and you notice that something doesn’t feel right anymore. The firmness is no longer there and when you put pressure on the seat, you sink down to the point where you feel the frame. You might believe that you need an entire new couch, but that may not be the case. First, check your frame. Is it still holding up sturdily? If you take out the cushions, is the upholstery still holding up strong? If so, then the only thing that you might need to do is to replace your couch cushions. Not only will this save money but replacement cushions will bring back that extra comfort that you so desperately missed. Besides, you wouldn’t want your guests nearly fracturing their tailbones on your saggy couch would you? Couch foam can be purchased through various foam manufacturers specializing in household furniture. The entire replacement process is fairly easy but accurate measurements are a must. 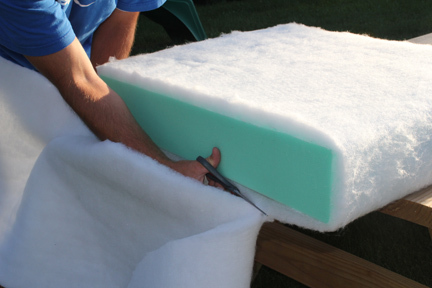 Take your old couch foam and measure it – length by width. Also, measure the thickness of the foam as some cushions might not fit an extremely thick piece of foam. Depending on your comfort preference, you can choose the different types of densities that foam come in. Once you’ve found the right type of foam, fit it inside your cushion cover. Because it won’t slide in as easily as it was taken out, gently work it in. Make sure you get the corners of the foam into the cushion’s corner. After zipping the cover closed, you’ve got yourself a brand new couch cushion. Now, you and your guests won’t have to worry about any bodily damage occurring from sitting down.